A burndown chart shows the amount of work remaining in a sprint or a release. It gives a quick visual cue on the work progress and the remaining work, and gives project teams the guideline to refine their estimation and reporting processes. A burndown chart is primarily an internal tool we use as part of our Agile processes. It is used when we do our daily standups as well as during the sprint retrospectives. 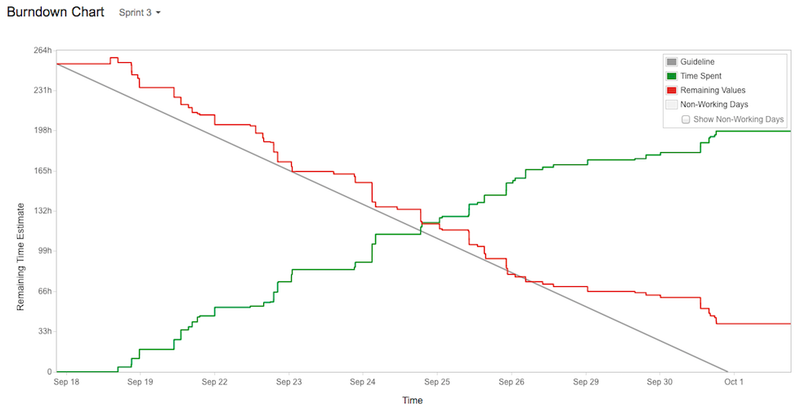 JIRA Agile provides us with the burndown charts of each sprint and release. A burndown chart plots time on the horizontal axis, and work pending on the vertical axis. It becomes easier for the team to estimate the possibility of achieving the sprint goal. In our standups, the chart helps us understand if estimates of complexity of stories are off the mark, and how should they be addressed. While burndown charts are used as an internal tool, we make them available on a daily basis to our clients as well, as part of our Single View status report. The objective is to be fully transparent with the client, using Agile project reporting. Burndown chart helps teams in self-organizing around the sprint goals. If, during the stand-up, the team thinks they are lagging behind as per the chart, they will take appropriate actions to bring the work back on track. For instance, they can reallocate tasks to resolve bottlenecks, add experts or people with experience in similar tasks to the team to speed up the process, or help with the more complex tasks. Even by doing all this, if they are still unable to meet the sprint goals and commitment, as the last step, the team can speak to the Product Owner and reduce the scope of the sprint. By viewing the pattern followed by a burndown chart, the team can take a call whether some of the stories should be dropped to ensure that the sprint goals are met on time, or if new stories can be taken up, because some of the stories have taken less time than estimated. Burndown charts show the true picture of the sprint. The Release Burndown chart in JIRA Agile shows the evolution of the release. It captures data in four buckets: Work Remaining; Work Completed; Work Added; and Work Forecast. By looking at this chart it becomes apparent how work happened over the sprints, and whether scope changed. The horizontal axis plots the sprints, and we plot story points on the vertical axis. You can also see how any stories that got added or deleted during the sprints affects the progress. This chart helps the team predict the number of sprints required to complete the work. It tracks the velocity across sprints to enable this prediction.